After launching the new Moto Z2 Play a few days back, Motorola is all set to launch its new flagship Moto Z2 that will be the successor to the last year's Moto Z smartphone. Not much leaks are currently available about the Moto Z2, but the device has just been spotted listed at GeekBench benchmark database confirming some of the specifications of the device again. The new Moto Z2 flagship is expected to come with upgraded specifications from the Moto Z launched last year, the Moto Z2 will have a similar design like the Moto Z2 Play but might have a bigger display than the Moto Z2 Play display. The Geekbench listing confirms some of the specs but not all. Let's check them out. 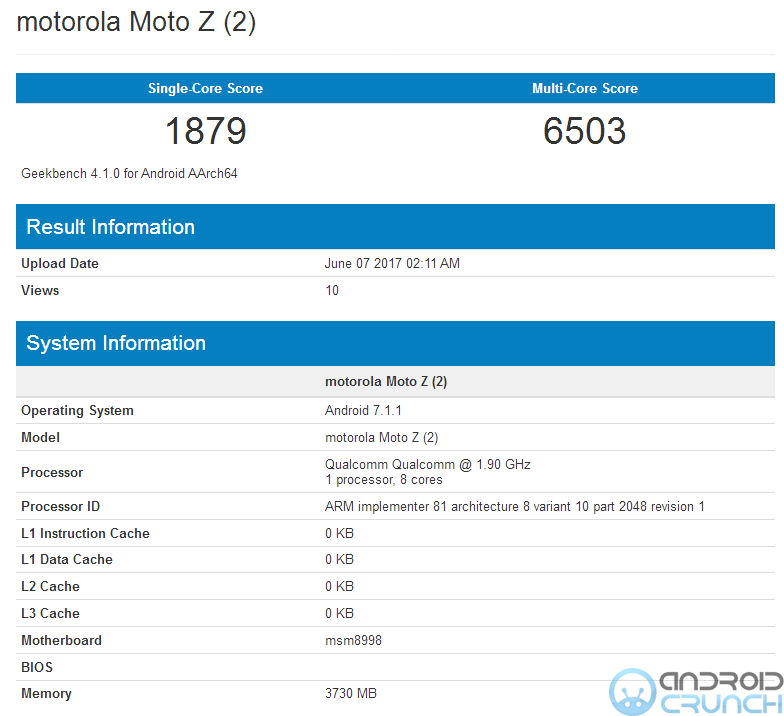 The Motorola Moto Z2 is listed at Geekbench with Android 7.1.1 Nougat OS out of the box and will be powered by the octa-core 1.90 GHz Snapdragon 835 (msm8998) processor with Adreno 540 GPU. It will have 4GB of RAM according to Geekbench while other details about the device are currently unavailable. The device scored 1879 points in the single core test while it scored 6503 points in the multi-core test. The predecessors Moto Z, Moto Z Force and Moto Z Play were having a same 5.5-inch display, so we can expect that the Moto Z2 will have a same size display of 5.5-inches just like the Moto Z2 Play and will have QHD resolution of 2560x1440 pixels with AMOLED 2.5D glass. 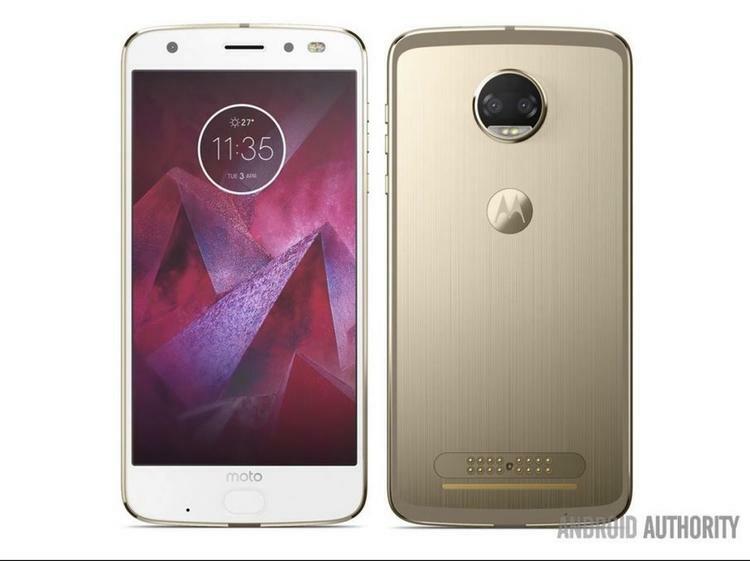 According to a leaked image recently by Androidauthority, the new Moto Z2 and Z2 Force are expected to feature a dual-rear camera with dual tone LED flash. The Moto Z2 Play was recently launched with a 5.5-inch full-HD Super AMOLED display with Corning Gorilla Glass 3 protection and 1080×1920 pixels resolution and is powered by a 2.2GHz Snapdragon 626 octa-core processor. it comes with two variants with one having 3GB of RAM and 32GB of inbuilt storage capacity while the second one having 4GB of RAM and 64GB of inbuilt storage capacity. The device will also have expandable storage with microSD card with up to 2TB of storage. It runs on the Android 7.1.1 Nougat OS out of the box and will have dual SIM support in some regions. It features a 12-megapixel rear camera with a colour correlated temperature (CCT) dual-LED flash, a 1.4-micron pixel sensor, f/1.7 aperture, laser and dual autofocus lens. It comes with a 5-megapixel front facing selfie camera with f/2.2 aperture, wide-angle lens and a front dual-LED CCT flash. It comes with a 3000mAh battery instead of the 3510mAh battery seen on the Moto Z Play and it comes with TurboPower charger that can provide 50 percent of charge in just 30 minutes. It is a water repellent smartphone with nano-coating. It comes with It sports a 3.5mm jack and comes with 4G LTE, Wi-Fi 802.11 a/g/b/n (2.4GHz and 5GHz), Bluetooth 4.2, USB Type-C (3.1), a 3.5mm headphone jack, NFC, GPS/ A-GPS, USB Type-C and FM radio support as well. it also comes with sensors like accelerometer, ambient light sensor, gyroscope, magnetometer, and proximity sensor. It measures 156.2×76.2×5.99mm and weighs 145 grams.